As its name suggests, a pole saw is a saw attached to the end of a pole. Pole saws can be manual, or powered by gas or electricity. They are used for trimming branches of trees and tall shrubbery without the use of a ladder. We reviewed dozens of pole saws to identify the best of the best, taking into account factors including price, Amazon reviews, usability, and durability. We narrowed our search down to 5 of the top-rated pole saws that are a great addition to any serious gardener’s toolkit. A reliable, cordless pole saw with a long-lasting battery. Our top pick for gardeners is the BLACK+DECKER LPP120. This cordless, battery-powered pole saw gets our vote because it’s practical, easy to use, and compatible with the BLACK+DECKER 20-volt MAX line of gardening tools. This top-rated pole saw is also powerful enough to make short work of challenging overhead trimming jobs. 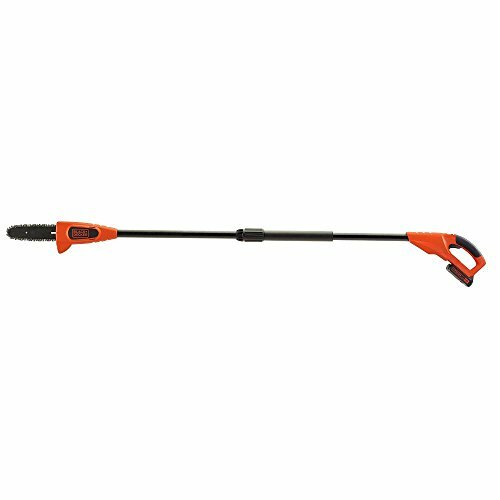 The BLACK+DECKER LPP120 is an excellent choice for most gardeners. It features a cordless design with a pole that extends to 6.5 feet or 10 feet, bringing cutting jobs up to 14 feet off the ground well into reach. Other features that make the LPP120 our top pick include its powerful 20-volt MAX Lithium Ion battery, lightweight design, and 8-inch cutting bar that allows you to power through branches up to 6 inches in diameter. Another key benefit of the LPP120 is its compatibility with the BLACK+DECKER 20-volt MAX line of gardening tools. Overall, this is a reliable tool that has the power and functionality to meet the expectations of the majority of gardeners and perform well for overhead trimming jobs. A convenient 2-in-1 chainsaw and pole saw combo tool with a powerful electric motor. The Remington RM1025SPS Ranger is a 2-in-1 chainsaw and pole saw combo tool with an adjustable aluminum pole that extends up to 10 feet. It is powered by an 8-amp electric motor and has a 10 inch bar and chain for easy limb pruning. The RM1025SPS Ranger is an affordable tool that offers easy and convenient trimming of small and medium size branches. It features handy flip and lock clamps which allow users to quickly disconnect the pole and use the chainsaw to cut up downed tree branches into manageable pieces. Most reviewers say they are pleased with the usability and performance of this product. A telescoping electric pole chain saw with a wallet-friendly price tag. Need a pole saw that will get the job done on a budget? The Sun Joe SWJ800E could be just the ticket. With its 6.5-amp motor and 8-inch Oregon cutting bar and chain, this tool is capable of cutting through stubborn tree limbs up to 7.5 inches thick. Other useful features include a telescoping pole that extends to 8.7 feet, an automatic chain lubrication system to keep the bar and chain fully lubricated during use, and a built-in safety switch to prevent accidental starting. At this price point, we think the SWJ800E represents excellent value for money. A lightweight and maneuverable electric pole saw with an adjustable aluminum shaft. 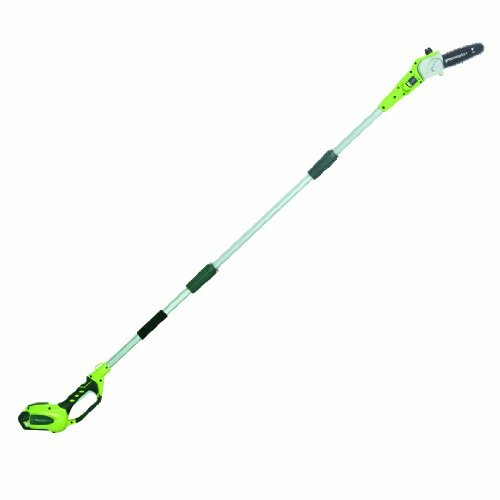 The Greenworks 40V Cordless Pole Saw features a G-MAX 40-volt Li-Ion battery and an 8-inch bar and chain for easy tree trimming. The adjustable 3-piece aluminum shaft can be extended to 8 feet to cut hard-to-reach overhead tree limbs. Other notable features include an easy adjust chain tensioning system for quick tightening of the chain, an automatic oiler that applies oil to the bar and chain to ensure durability, and a translucent oil tank to view oil levels. A battery and charger are included with this model. A powerful gas pole saw with a 25cc 2-cycle engine. Our top choice in the gas pole saw category is the Remington RM25PS Maverick. This capable and hardworking garden tool features a 25cc 2-cycle engine that has plenty of power to cut through tough tree limbs with ease. The 8-inch bar and chain is mounted on a 7-foot extension pole, allowing the user to reach up to 12 feet in length. This model includes an auto-oiler to ensure the chain is always properly lubricated, and Quick Start Technology to help the pole saw start easily every time. The Remington RM25PS also accepts attachments, so users can switch easily between attachment heads to accomplish different yard tasks. If you have trees or tall shrubs on your property, a pole saw will help you remove branches that would normally require a ladder to reach. As well as extending vertically, they are effective for reaching across objects like hedges and fences. There are three main types of pole saws: manual, electric, and gas-powered. When deciding which to buy, consider your individual requirements. Light pruning can be achieved with a manual pole saw, but a powered pole saw will be better suited to heavier pruning of thicker branches. Some powered pole saws have detachable chainsaws that are useful for cutting downed tree branches into smaller pieces. These can be a good choice for gardeners who prefer an all-in-one tool. If you’re looking for a dedicated chainsaw, check out our article on The Best & Safest Chain Saws. Electric. Electric pole saws are available in cordless battery-powered or corded models. Cordless battery-powered pole saws are great for smaller gardens with a small number of trees. They are a popular choice with gardeners because of their portability and convenience. Cordless battery-powered pole saws are usually less powerful than corded pole saws, and are best suited to cutting small to medium size branches. Corded electric pole saws are more powerful than cordless versions, but they are just as simple to use. The only limitation is the length of the power cord. Gas-powered. Gas-powered pole saws are more powerful than electric versions of the tool. This makes them ideal for tackling heavy pruning of medium and large size branches. Disadvantages include increased noise and emission of fumes. Gas-powered pole saws are often built to last longer than electric pole saws, but they will require maintenance from time to time. Manual. Manual pole saws will require more effort from the user than gas or electric versions, but they can be found in much longer lengths than powered saws. This makes them a good option for people with very tall trees on their property. Manual pole saws are also likely to need less maintenance than powered saws. Pole reach. Poles come in various lengths, so it’s important to take into account the height of the tallest branches you need to reach before buying a pole saw. Some models have adjustable poles, these are a smart buy as they can cut branches of different heights and are easier to store and transport. Other models allow the user to disconnect the chainsaw from the pole. This feature can come in handy for cutting fallen branches into manageable pieces. Check the manufacturer’s information to find the length and type of pole, and keep in mind that some manufacturers will state pole reach (which includes the average user’s height), rather than pole length. Bar length. The bar is the plate that the chain spins around on electric and gas-powered pole saws. A longer bar enables thicker branches to be cut. Consider the thickness of the branches you want to cut, and choose a pole saw with a bar length that is greater than the largest branches. Pole saws with longer bar sizes require more power to drive the chain. This is why gas-powered pole saws often have longer bars than less powerful electric versions. Weight. Working with a pole saw for extended periods of time can be tiring, so you may want to consider the weight of the tool before making a purchase. Electric pole saws are a good choice for gardeners who require a lightweight tool as they are usually a lot lighter than their gas-powered cousins. What is a pole saw and how does it work? A pole saw is a saw attached to the end of a pole. It is used for trimming trees and tall shrubs without the use of a ladder. Pole saws come in three types: manual, electric, and gas-powered. Manual pole saws work in much the same way as a standard saw. Electric and gas-powered pole saws use a chainsaw to cut through branches more easily. How do you use a pole saw for tree pruning? A pole saw can be used vertically for overhead pruning or extended across objects such as fences and hedges. This makes it easy for the user to trim branches without using a ladder. What safety gear should you wear when using a pole saw? Safety glasses, a helmet, non-slip work gloves, and closed toed shoes or boots are the most most important items of safety gear to wear when using a pole saw. You should also wear long pants to prevent injury to the legs from falling debris. It’s also important to wear hearing protection if your pole saw emits a lot of noise. Can you use a pole saw on a ladder? No. It is very dangerous to use a pole saw with a ladder. The tool is designed to be used from a standing position at ground level. We looked at 20 other pole saws. Even though they didn’t make our 5 best pole saws list, they’re the best of the rest and each is still a great option for homeowners. The information you’ll need to compare each one is included with the listing. Prices are estimated at the time of publication and are subject to change. This 24V pole saw from Greenworks has a range of handy features including an easy adjust chain tensioning system, automatic oiler, and a 3-piece extendable aluminum shaft. This high-end pole saw from Greenworks offers premium features including a reliable brushless motor, 80V battery, and automatic oiler. A cordless, telescoping electric pole saw with a 4.0Ah Lithium-ion battery and an 8-inch Oregon chain. Reviewers say they are impressed with the power and long battery life this product offers. A compact and lightweight corded electric pole saw with a patented auto-tension chain system for extended bar and chain life. The PP610 is a great option for lightweight, powerful performance. This model features a 6.5-amp motor and a 10-inch premium bar and chain for improved cutting performance. This 8-amp electric chainsaw and pole saw combo tool from Remington features easy flip and lock clamps that quickly secure pole length, along with nonslip grip for comfortable use. 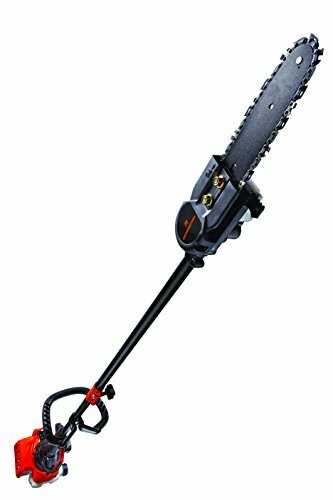 This popular pole saw from Sun Joe features a convenient multi-position head and a 6.5-amp motor that can cut through branches up to 7.5 inches thick. The Sun Joe SWJ803E-CMO tackles hard-to-reach branches with ease. Features include a durable 10-inch Oregon bar and chain, an 8-amp motor, and a telescoping pole that extends to 7.2 feet. This 2-in-1 tool from Sun Joe allows you to quickly convert from pole chainsaw to handheld chainsaw. Reviewers say the product is fast, lightweight, and powerful enough to cut through most branches with ease. The Sun Joe SWJ806E is a pole chainsaw and chainsaw combo tool that’s ideal for cutting overhanging limbs and thin logs. Reviewers say it’s light, sturdy, and surprisingly powerful. A sturdy, practical pole saw that converts into a chainsaw. This model features a powerful 8-amp motor that cuts branches up to 7 inches thick. This top-of-the-range pole saw from Echo is a heavy-duty tool for serious gardeners. Professional features include a 25.4cc engine and a 12-inch bar length. 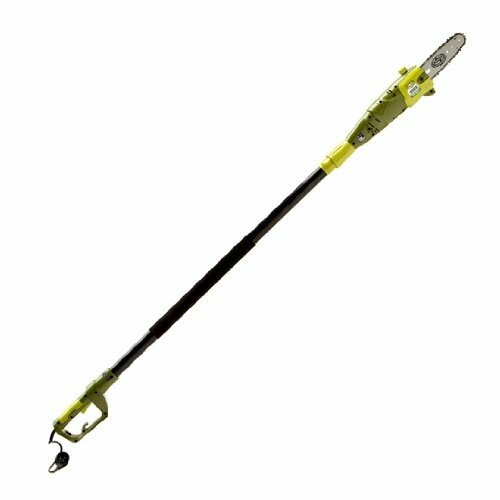 A powerful gas pole saw with a long reach that can easily cut down branches of 13-16.5 feet without the use of a ladder. This add-on TrimmerPlus PS720 pole saw can be used to trim branches on trees without using a ladder. It is compatible with a range of attachment-capable trimmers and is backed by a 2-year limited warranty. This extendable pole saw from Fiskars extends up to 12 feet so you can quickly and easily cut through high branches. An easy-to-use fiberglass manual pole saw that extends up to 14 feet. Reviewers say the saw cuts through branches quickly and efficiently with little effort. A durable, high-quality manual pole saw featuring a 16-inch curved saw blade with non-stick coating, and a 3-piece fiberglass pole with an 18-foot reach. A versatile 3 pole system for trimming at a variety of heights, this kit from Jameson includes three 6-foot poles for 18 feet of reach. A strong, lightweight, and durable manual pole saw with non-stick carbon steel blades for easy maintenance. There’s only one choice for the tallest of trees, this 27-foot pole saw from Pole Saw Direct. The sturdy pole saw features a commercial-grade blade and collapses to 8 feet for easy storage. Richard Rowlands is a contributing writer at Family Living Today. He has been freelance writing since 2014. Richard’s interests include pets, health, and home improvement.